It’s getting harder and harder to live a simple life. I’m not talking about politics. I’m talking about being able to take a walk without having to breathe in the “fumes” from people’s laundry. I’m talking about being subjected to the smell of people’s detergent and dryer sheets when you go anywhere in public. Advertisements show people swooning over a towel after it’s been washed. They show folks taking ecstatic breaths when their clothes come out of the dryer. OH my goodness. Did you know that cleaning products are not required by law to list all ingredients on the box? “Fragrance,” listed as a single ingredient, can contain up to 200 chemicals. In an article called Toxic Laundry by Hiyaguha Cohen, she relates a study in which laundry got washed “with the scented detergent and then run through the dryer with a popular brand of scented dryer sheet. The scientists monitored the emissions coming from the dryers during each laundry load. After analysis, it turned out that the dryer vents emitted 25 volatile organic compounds (VOCs)…chemical compounds that can cause long-term health effects. The EPA classifies seven of the VOCs as hazardous air pollutants, and two — acetaldehyde and benzene — as carcinogens with no safe exposure level. In other words, even a small whiff of dryer fumes once in a blue moon can cause health problems. “When both dryer sheets and the scented laundry were used, the emissions contained 17 more VOCs, including acetaldehyde, acetone, benzaldehyde, butanal, dodecane, hexanal, limonene, nonanal, octanal, tetramethylpropylidene cyclopropane, 1-(1,1-dimethylethyl)-4-ethylbenzene, 1-propanal, 2-butanone, and 2,7-dimethyl-2,7-octanediol….. 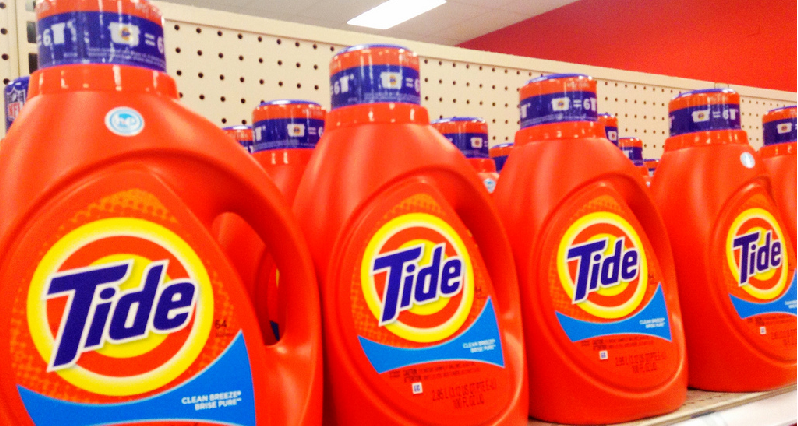 I recently had an experience with one detergent, Tide. Here’s the letter I wrote to the CEO of Tide (Proctor & Gamble) on December 13, 2018. “Dear Mr. Taylor, I use safe cleaning products in my home. Two weeks ago, however, I visited my brother in Asheville, NC and used a bottle of Tide liquid laundry detergent he had in his home. I’d like to know what ingredients in that product won’t wash out, won’t dissipate even though I’ve washed my clothes here at home four times, and each time afterwards hung those clothes outside on my line, where they are right now. My clothes included a 100% merino wool sweater, a pair of Nike fleece-lined exercise pants, underwear that is nylon, some that is organic cotton, and Darn Tough socks. I can’t bring the clothes inside because they still smell of whatever synthetic “perfume” is in that liquid Tide. The fake smell is simply awful! I am more concerned about the effect of those chemicals on my skin. I am concerned what happens to lungs when the chemicals are breathed in. I would like to know what I’m dealing with, what might remove the chemical from my clothes. I’ve tried vinegar, soap, baking soda, all to no avail. (Since this letter was sent, I’ve washed those clothes 14 more times and have continued hanging them outside between washes. They still smell of fragrance from Tide. Yes, the Consumer Care office at Proctor & Gamble answered my letter and wrote that they list their ingredients on their website. As directed, I went there and looked, but there were no ingredients for fragrance! When I wrote them back about this, Consumer Care went silent. Call to action. If, like me, you want to live a simpler life, contact manufacturers. Consumer opinion can have a real impact and create a shift. A good brand image is important to every business. Make companies accountable, make them change so you can live more simply.